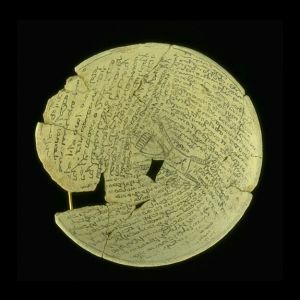 One scribe hold a hinged writing board covered in wax. Actual examples of the boards have been excavated at the Assyrian city of Nimrud. Information could be recorded and then the wax melted and reused. The bearded man is writing in a scroll, probably in Aramaic - the main spoken language of the Near East. 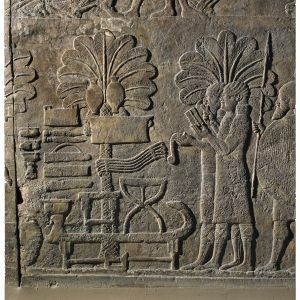 Alternatively, he may be a war artist, recording details of the campaign for use by sculptors creating reliefs such as this one back in Nineveh. 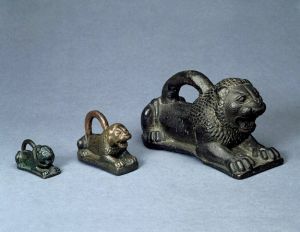 Small bronze lion shaped measuring-weight with ring: inscribed in Assyrian and in Aramaic. Five lines are incised on the flank of the lion, presumably to represent 'one-fifth'. The lion, when originally cast, was too light, and the ring around its neck brought its weight up to the desired amount. Inscription Translation: Palace of Shalmaneser, king of Assyria; one fifth of a mina of the king. The ancient Assyrian language is classified as Akkadian, the language of a people who together with Sumerians became the predecessors of the ancient Assyrians and Babylonians. To facilitate administrative tasks of the Assyrian Empire long before the fall of Nineveh the use of the Aramaic was sanctioned by the government because in distant part of the empire the Aramaic language was far better known than the Akkadian. The empire chancelleries adopted a simple standard form of the Aramaic for correspondence with such areas " In the hearth of the Empire "Aramaic "dockets" were attached to the cuneiform tablets. Such dockets gave brief indication of names and dates and a summary of the contents which were useful to merchants. This is classified as "Official Aramaic". Many Assyrian tablets have been found with Aramaic incised on them. Assyrian scribes are often depicted in pairs. One writing in Akkadian on the cuneiform tablet, the other writing in Aramaic on the parchment or papyrus. Among several bronze lion-weights found at Nineveh some had both the Akkadian and Aramaic text inscribed on them . They bore the names of the Assyrian kings at the time of use which included Shalmansser III (858-824), Sargon (721-705), Sennacherib (704-681) .The Official Aramaic later became accepted as the standard form of literary communication by the Aramaic speaking people in various part of the Empire. Bronze Lion weight inscribed in Assyrian; "palace of Shalmanser, King of Assyria , two third of a mina of the king' , and in Aramaic "Two thirds ( of a mina) of the Land". According to the Old Testament, "in 701 B.C. 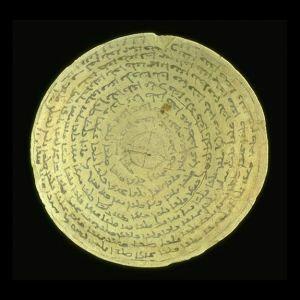 when official of Sennacherib appeared before the walls of Jerusalem, and the Rab-Shakeh spoke in Hebrew to the officers of King Hezekiah, these latter begged him to speak rather in Aramaic, for they understood this official tongue and did not want the populace to hear the humiliating demand for submission made in Hebrew." In later centuries Aramaic replaced Hebrew even in Israel. During their exile years in Babylon the Jews adopted the Square Assyrian script which was commonly known to them as Ketav Ashuri or the Assyrian text. The law demands that a Torah scroll be written with the " ketav Ashuri" so called after its place of origin. In time Aramaic became spoken in Mesopotamia also and gradually replacing the Akkadian language. The transition was made possible because the 22 letters Aramaic alphabet was much easier to master than the 600 or so signs of the cuneiform. The evidence of side by side existance of the two langauges at 4th century B.C. is an Aramic document from Urk which has been written in cuneiform. The Akkadian Language continued to be used for astronomical texts down to the time of christ. Administrative text in Akkadian language from Babylon about the activities of Mardukh temple continued till 92 B.C., astronomical chronicles have been found which date to 76 A.D.. The 2nd century A.D. novelist Iamblichus reported that the Akkadian language was spoken along with the Aramaic at his time. Most old langauges for different reasons have gone through drastic changes from time to time. For example the Old English language has changed greatly from what it was at early Christian centuries. Present day English reader will have dificaulty reading and undrestanding the Lord's prayer as written at that time as seen below. "Feder Ure bu be eart on hefonum, si bin nama gehalgod. To becume bin rice. Gewurbe Oin willa on Eoroan swa swa on heoronum. ..."
Today's Persian language has no similarity to what was spoken by the Achaemenian Persians. The Greek and the Armenian languages have changed greatly since the ancient times. The contemporary Assyrians use thousands of word in their daily conversation which are clearly Akkadian . The Syriac, another name for the Christian Assyrian language, was perhaps in use as a literary language in northern Mesopotamia before the Christian era but only a few written examples of it have survived from the first century A.D. It developed as a literary language of some importance in Edessa after a christian school succeeded a pagan learning center. Gradually it was accepted as the ecclesiastical and cultural language of Assyrian Christians. It is often wrongly called Aramaic but in reality it is a different langauge though related to it just as the European langauges are related to Latin but are not exactly the same. Currently there are two slightly different dialects of the Syriac language called Eastern and Western, i.e. Suryaye and Suryoye. Some differences in pronunciation between the ancient and the present day Assyrian words may be due to mispronunciation of the Cuneiform signs by the translators. Some Akkadian signs can be vocalized in more than one way. The same word is often ponounced slightly differently by different scholars. Some Syriac words have gone through varriation in pronounciation because of peuliarity of how the Syriac words are accented compared to the Akkadian language, also during the last two thousand years some words have gone through slight modification. In some words the letter B is pronounced as V. For example the Akkadian Abu for father is pronounced as Ava-ha for parent. The Akkadian Q at times is softened into khap in the Syriac language. The contemporary Eastern Syriac words presented here belong to the Urmi Dialect which may be slightly different than that of the northern Iraq or the north of Mosul Mountain accents still spoken in some places. The presence of the Akkdian Words in Syriac does not seem accidental because of their greater number, and that they are scattered evenly along the entire alphabet and all sorts of subjects. Because the present Syriac to English and vs-versa dictionaries are inadequate, the extent of the Akkadian words in this language is difficult to ascertain. It should be noted that while the ancient Assyrian words universaly ended in "U" the contemporary Eastern Assyrian words in their basic form end in "A". The vowel "A" of Eastern dialect in all cases is pronounced as "O" in the western Assyrian/Syriac speech of today. The vocabulary presented here consists mostly of single words without their usual derivatives and inflected forms such as verb tense, adjectives, adverbs , plural and gender forms and others. With the addition of these variations and further finds this list can grow into thousands of entries. One hundred words of this concordance was compiled by Peter Bet Basso from the "State Archives of Assyria, Volume III: Court Poetry and Literary Miscellanea", by Alasdair Livingstone, Helsinki University Press. The balance was added by William Warda from the glossaries contained in the following sources. Only the first two pages of this list has been updated to include a greater number of words common between the two languages but these are by no mean all. The western Assyrian/Syriac pronunciation of these words was provided by Gowriel.